Developing cross platform games confronts you with a large number of operating systems, processor architectures, graphics APIs and input methods. But don't forget about all the different screen sizes, orientations and aspect ratios, which you need to take into account for FOV and HUD design! Nowadays, Widescreen 16:9 has become the de-factor standard for hoe entertainment and desktop computers, while 4:3 can still be found on older devices, 5:4 dominates the office space and 21:9 becomes more and more popular. To support this wide range of aspect ratios, game developers had to put adjustable FOV into their games for years now. Typically, this FOV is measured horizontally. By this method, a widescreen has a larger field of view than a 4:3 screen. 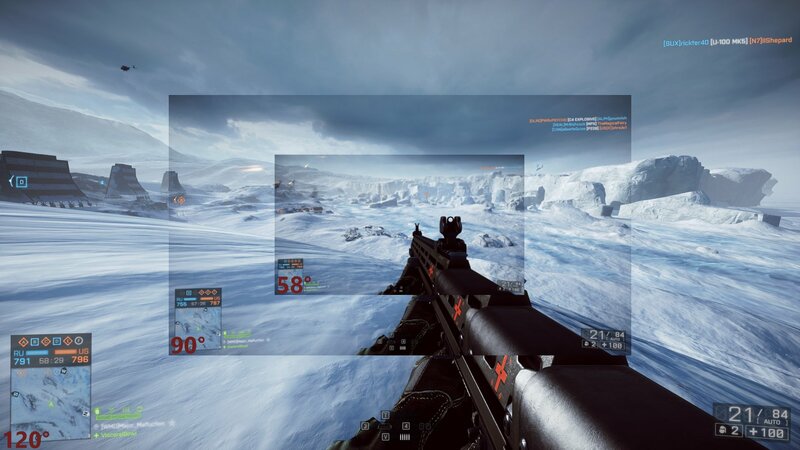 If the user does not adjust the horizontal FOV, the game will appear to "zoom in". Look how the ship moves back into the distance with a higher FOV. Of course you can get the same effect by manipulating the FOV in ShiVa. Note how in addition to the zoom effect your sense of depth also changes. Wider FOVs make objects look more distant to each other, and narrower FOVs feel more crowded. Gamers often use unrealistically large FOVs to gain an advantage, since they can see so much more of the environment. This comes at the cost of severe fisheye image distortion which makes a lot of people sick. Unlike many other game engines, ShiVa's Field of View calculations are based on the the vertical FOV rather than the horizontal FOV. This usually referred to as "Hor+" Mode, which means that the game will not suffer any distortions going from a more square screen like 5:4 or 4:3 to 16:9 or 21:9. Gaming at wider aspect ratios in Hor+ can give you a distinctive advantage, since you can see a lot more of the scene vertically. Note how the car and sign disappear in 16:9. To calculate the proper FOV for a screen, you can use the following formula. Make sure your units match, do not mix inches, feet and meters. The placement of HUDs requires some thought with different aspect ratios. You can quickly make the mistake of anchoring vital information to the screen corners, like in this Battlefield screenshot. The area of focus for player is the middle of the screen. To see the map and important stats, bad anchoring forces the player to move their head and eyes away from the center of the screen, taking their attention away in addition to creating neck fatigue. A much better solution offer shooters like Quake Champions, where the HUD is aligned around a virtual 4:3 or 16:9 monitor in the middle, with the sides rendering the extended field of view. ShiVa's "keep aspect ratio" does exactly that. A centered 100x100 component in aspect ratio independent mode is a square in the middle of the screen that stays there no matter how wide the screen gets. Bot that's not to say that there is no use case for corner anchoring, just don't use it to display vital player stats. However, it is the perfect setting for things like touch joysticks, where you get to see a lot more of the game world by moving the input controls as far to the side as possible. Keeping the aspect ration is a problem however with portrait orientations where the aspect ratio is smaller than 1. Since ShiVa does not know whether and in which way to scale your components, they simply get cut off. A similar problem affects components that are anchored to a corner. If the screen becomes too narrow, like in portrait mode of a phone, these components can overlap, as shown here with the life bar and score counter in The Hunt. Of course, HUDs can both overlap and be cut off at the same time if you have centered components that are too large. The answer to these issues is containers. Containers are HUD elements which can be used to group elements that belong together logically, like a row of buttons. That makes it particularly easy to move these elements around all at once, scale them, animate/show/hide them and so forth. However 100x100 containers can also be used to provide a reference frame which can be used to dynamically adjust child components. Let's put our button bar from before into a parent container. The bar itself is aspect ratio independent, however the container is must not be. The onARChanged event handles the actual scaling. Since we only have one parent container, we only have one scaling operation to take care of, however if you have multiple anchored groups, like a top scale container or two for the left and right side, you would need to scale every parent container individually. To illustrate the result, I have chosen a green background color for the parent container. At aspect ratios bigger than 1, it fills the entire screen, while the child button bar stays aspect ratio independent. With aspect ratios smaller than 1 however, the container dynamically scales down to the bottom of the screen, adjusting the scale of the children in the process. To summarize, which methods should you choose, and when?